For nearly four weeks, Gov. Peter Shumlin's administration has blamed the Federal Emergency Management Agency for misleading — and even deceiving — the state into believing it was due more in Tropical Storm Irene recovery funding than it may eventually receive. 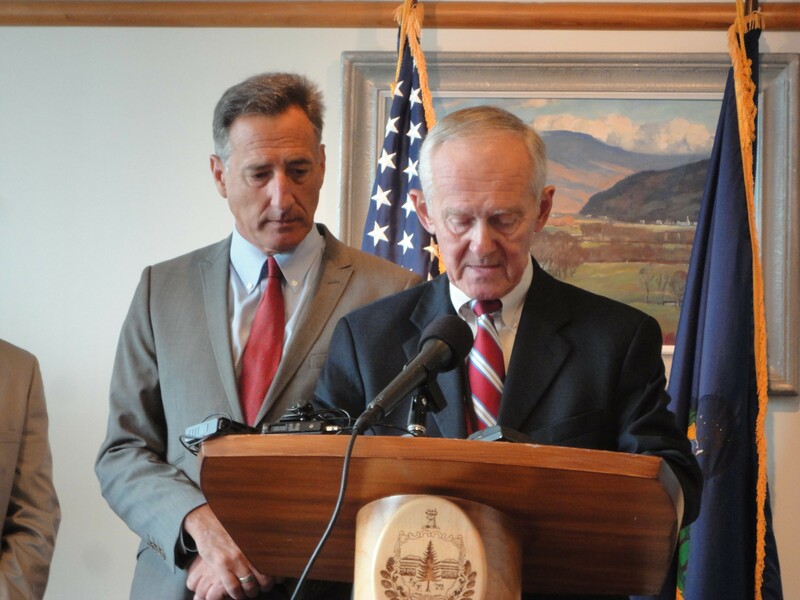 But on Tuesday, Shumlin sought to hit the reset button with the feds. "I'm proud of the relationship we have developed with FEMA," the governor said, unprompted, at his weekly press conference. "I can tell you that in talking with other governors about recovery efforts like this, there is not a governor in the country who will tell you that there aren't good days with FEMA, there aren't bad days with FEMA, that there aren't happy days with FEMA, that there aren't sad days with FEMA. And we have to expect that we're going to have exactly the same experience here in the state of Vermont." The governor's newly conciliatory tone toward FEMA comes as the agency continues to weigh the level at which it will reimburse Vermont for the replacement of the state psychiatric hospital and the Waterbury State Office Complex — both of which were badly damaged by Irene. Contrary to reports earlier this week, Shumlin said Tuesday that an announcement from FEMA outlining how much funding the state should expect is still three to four weeks away. Shumlin and the state's congressional delegation are continuing to lobby for the maximum amount of funding, the governor said. "Bottom line: Has the federal government done well to the state of Vermont? The answer is yes," Shumlin said. "They've been extremely generous so far, and I expect them to continue to be generous." Shumlin's comments signaled a notable departure from the three-way blame game that's emerged since the administration informed lawmakers July 20 that funding estimates were in doubt because of a misunderstanding over whether "damaged" — not just "destroyed" — buildings qualified for full reimbursement. Administration officials blamed FEMA for the multimillion dollar mixup. Shumlin's Republican opponent, Sen. Randy Brock (R-Franklin) blamed the governor. And FEMA? Well, they mostly minded their own beeswax. Asked Tuesday if he stood by or disagreed with remarks members of his administration made disparaging the federal agency, Shumlin tried to walk his subordinates' comments back. "There was understandable frustration over the issue of 'damaged' versus 'destroyed,'" he said, adding later that, "there was some frustration out there that needed to be vented" about inaccurate information the administration says it received from a FEMA contractor." The governor also walked back his own remarks to the editorial board of the Rutland Herald and Barre-Montpelier Times Argus, in which he said, "The head person from FEMA made us all kinds of promises. We've got emails saying we're going to get this." Asked about those comments Tuesday, Shumlin said he "didn't speak as eloquently as [he] should have." "It was a rambling, long conversation that I had with a very intelligent editorial board," he added. "We talked about all kinds of issues. The word 'promised' was not the best choice of words." Though his administration has sought to lower expectations in recent weeks about how much FEMA will provide Vermont, Shumlin struck a surprisingly optimistic tone, saying, "I think this process is going exactly as should be expected and it's going very, very well for Vermont." Shumlin was less clear about how FEMA's decision would impact his plan to rebuild state office buildings in Waterbury. Though he said the state would not move forward with its current plan absent FEMA funding — and characterized the state as walking a "tightrope" as it waits for an answer — he seemed unwilling to say that his administration has ramped up contingency planning to prepare for bad news. He also refused to identify what alternatives might look like. After reporters — led by the Vermont Press Bureau's Peter Hirschfeld — pressed the governor to elaborate on the administration's contingency planning, Shumlin grew visibly frustrated. "Let me be clear, Peter. I don't know, maybe I'm not being clear, so let me try it one more time," he said. "We are going to get the resources that we need from FEMA to implement the plans that we have outlined. That's my goal as governor. I believe we'll succeed." "So FEMA's coming through is what the news is here?" Hirschfeld asked. "I believe that FEMA will come through," the gov said. Though his Republican challenger, Sen. Randy Brock (R-Franklin), has fastened on to the FEMA funding issue in recent weeks, criticizing the governor's handling of it, Shumlin refused to address his opponent's remarks Tuesday, maintaining his policy of pretending he's not engaged in a campaign for reelection. No matter that his very own Administration Secretary showed up at a Brock press conference two weeks ago to refute Brock's allegations! And that he's been raising money up the wazoo for his reelect fund. And that he personally phoned the head of a pro-marijuana group two weeks ago to solicit funds from its PAC. And that he's planning to campaign for Democratic lieutenant gubernatorial candidate Cassandra Gekas in Burlington on Thursday. "I really need to spend all my waking hours for at least one and three quarters of my two-year assignment doing the job that I need to do," Shumlin said, rattling off a list of policy priorities he's focused on instead of campaigning. "These are the things I focus on every day. I can't do that and campaign—"
So why are you campaigning for Cassandra Gekas on Thursday? You're endorsing her campaign during the workday when you're acting as governor. Shumlin: "I think that stopping by for 10 minutes to help someone launch a campaign versus my entering into a continuous campaign for 24 months in a 24 month term are very different." So you have 10 minutes to spend campaigning for the Democratic candidate for lieutenant governor, but not to address Randy Brock's comments? "My point is a simple one: if you want to preserve a two-year term in Vermont, which I do, it's very important, in my view, that the campaigns be a reasonable period of time where a governor focuses both on doing the job and running for reelection," he said. "That time is not now." Brock, for his part, isn't buying it. "I think one reason he may be so unwilling to engage is that I'm right and he's wrong," Brock said later Tuesday. "I think it's a myth that he's not campaigning," the senator said. "I think everyone knows he's campaigning." Brock's evidence? A four-day tour the governor has scheduled for the days leading up to Irene's one-year anniversary, during which he'll visit 22 Vermont towns hit hardest by the storm. "If that isn't a taxpayer-funded campaign junket, I've never seen one," Brock said. "That has every evidence of bringing the campaign to every corner of Vermont that was touched by Irene. I can't imagine a more political event."